The bedrock geology within the Cascade Mountain system is diverse and complex. This is due to the fact that the rocks here were originally deposited sequentially from the oceanic plate onto the continent over hundreds of millions of years. These formations originated somewhere within the Pacific Basin far to the W or SW. Subsequently, these rocks were then folded, faulted and metamorphosed into new rock types. At the same time, the subduction process caused volcanoes such as Mt. Baker to form and erupt. 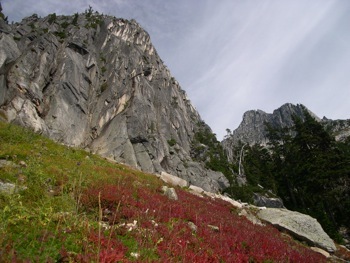 The rocks of the upland areas in the NW and central portions of the lower Chilliwack River valley are mostly metamorphic and sedimentary volcanic as well as igneous intrusive in origin. A small segment of this area contains metamorphic rocks such as serpentine, phyllite and gneiss. Portions of the central valley as well as upland areas immediately E of Cultus Lake are characterized by the presence of sandstones, siltstones and breccias. These rocks, collectively called the Cultus Formation, are often layered and are susceptible to erosion. 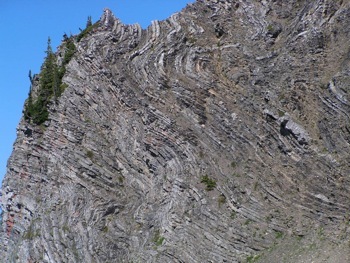 Research has shown the occurrence of significant folding and faulting as well as varied ages here. In general, the rocks of the Cultus Lake area are ~130 million years younger than those of the E portion of the Chilliwack valley. Large portions of the central valley are also composed of rocks which are collectively called the Chilliwack Formation (or Chilliwack Group). These are a mix of highly folded and faulted metamorphosed pelite and sandstone, some conglomerate, pyroclastic rocks, greenstone and limestone rock types. An example of this is the upper reaches of Mt. McGuire which is essentially a huge mass of weathered limestone – clues to this are the light colored rock, the caves nearby and the karst topography of its W side. Some of the metamorphice rocks include serpentine, phyllite and gneiss. A smaller area just NW of Chilliwack Lake consists mainly of quartz diorite. Conglomerates are also found in the mid-valley area. Rocks immediately W and E of Chilliwack Lake (including upper Centre Ck, Nesakwatch Ck and Slesse Ck areas) as well as a tongue stretching N to Cheam Ridge and more broadly to the S are part of the large underlying granitic batholith (called the Chilliwack Batholith) which extends well S into Washington state. Thus, much of Mt. Slesse is composed of granitic rocks such as grey diorite; although some of the upper parts of the mountain consist of metamorphic rocks such as phyllite (which is even darker in color). Also of note are the grand granitic domes and spires of the Illusion and Rexford Groups – their steep smooth sides are often riddled with rectangular ‘pits’ caused slabs which weather off (watch out below!). ‘Pi Pillar’ on Rexford’s shoulder is such an example – in this case the surrounding slabs have fallen away leaving in-situ, 2 slabs with a weathered slab lying on top. Gneiss rocks can be found along the E edge of the granitic body to the N and E of Chilliwack Lake (including part of Custer Ridge). The granitic batholith rock stretches to Cheam Ridge but is mainly exposed on the ridges lower NE flanks. 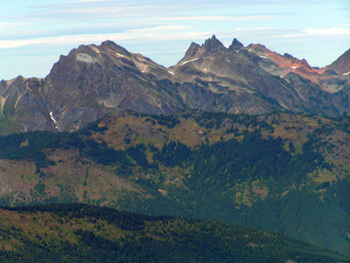 The upper areas of the ridge are mainly composed of volcanic rock (Chilliwack Formation) such as argillite. The granitic rock is usually grey in color while some of the volcanic rock weathers to rusty brown to dark brown to black colours. 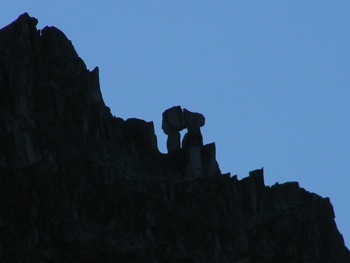 The N-S bearing contact between these 2 types of rocks is visible as it runs between Mt. Cheam and Four Brothers Mtn. in the N and cuts across Cheam Ridge just E of Foley Peak to continue S to the Foley Ck area. At this contact some mineralization is known to occur such as sulphides. From 1917 – 1965, the Lucky Four Mine operated (on and off) to extract copper sulphide ore from a working near the contact not far E of Foley Peak on the edge of the Foley Glacier. At that time miners built a fine trail (which still exists today) extending up from the Wahleach Lake to Mile High Camp and continuing above to Cheam Ridge (W of Conway Peak). The volcanic rock of Cheam ridge is typically irregular in form, significantly fractured and jointed in places, notched and chuted, and forms scree covered ledges as well as large scree slopes in places. Mountaineering routes here tend to follow such features. However, most routes are more easily travelled with good snow cover. Rock slides have been documented in this area – a large rock slide took place ~4,350-5,010 years ago when an enormous wedge of rock fell from an unnamed mountain immediately SW of Mt. Cheam. It is possible that numerous slides have occurred here over time. The rock debris currently resides as a hummocky landform lying along the S shore of the Fraser River. 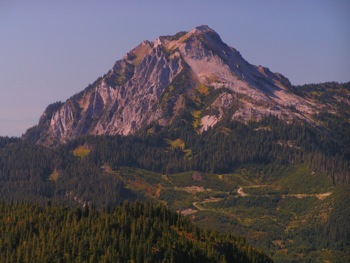 The rocks of Vedder Mtn. lay outside those discussed above. These sedimentary rocks on the upper and E section consist of mainly greywackes and shales. Other areas of the mountain are composed of foliated quartz diorite, schist and greenstone. Some of these rock types are currently being quarried there. Terraces of various sizes and materials (mostly sands and gravels) are positioned along the valley bottom with the river eroding these in places. The largest of these is called Larsons Bench, the main body of which extends for 18 km from Chilliwack Lake to near Slesse Ck confluence. These are thought to have formed from the large glacial lake which existed throughout the valley. Bedrock outcrop is obvious in many places – sometimes as high walls descending to the rivers edge. Alluvial fans can be seen at some side creek confluences. The river bed rests on glacial sediments throughout much of this section. The river bed within this section is set mainly within glacial silts overlying glacial sands and gravels. Bedrock outcrops in places. Alluvial fans are present at some side creek confluences. The terrain changes quickly from narrow walls to wide and open. The river bed here sits within glacial sand, gravel and till materials overlying silts. The river meanders significantly through this section. Fresh sediments of various types and sizes are also found within the river bed. Some alluvial fans protrude into the river bed at side creek confluences. The river displays some braiding. Tamihi rapids are located just upstream of ‘Tamihi Bridge’ – these rapids result from a narrowing of the river bed coinciding with a more rapid drop in elevation and the many boulders within the bed. This section contains younger soil and fluvial (river carried material) deposits. The N side of the valley commonly contains till, silt and fluvial sands. The S valley wall has some exposures of bedrock. Some alluvial fans have formed near the confluences of some creeks. The river is braided with some dry channels, sandy beaches and boulders of various sizes. The river bed location changes with time. Sections of the Chilliwack River shown in the NTS 1:50K ‘Chilliwack’ map (092h04), based on information from 1988, have since moved significantly. The river overlies a thick layer of till up to 50m deep. Caves in the SW mainland of BC are rare. However, forested karst areas are known to occur in the Chilliwack area associated with the limestone formations of the Chilliwack Group. These formations are either ~30m thick or 30-60m thick (although some sections have been found to be up to 600m thick). The rock itself weathers light to dark grey in colour. Numerous caves have been identified within these areas, some of which are known to exhibit extensive speleothems such as stalactites, stalagmites and flowstones. Also sink holes, underground streams and cliff structures can also be found. The most well known caves are the Chipmunk Caves which are located right along the S side of the Chilliwack River as shown on the Chilliwack East Recreational Map – GPS Based. The caves were originally visited by the local Sto:lo people and then by others in the 1950s. Surveys have shown there to be ~135m of passage although some of this is very difficult. Originally these caves displayed fine examples of white flowstones, stalagmites, moonmilk, as well as Townsend’s long-eared bat which resided within. The main opening here reduces quickly to more confined spaces within. A few small, broken stalactites might be seen. A little downstream and above, old ladders lead to other small openings – these are too small to enter. One small opening is located near the river edge. Essentially, a large part of this steep, forested hill is riddled with small openings but only the main opening is safe to enter. The side creek which flows in front of the main opening can be followed a short distance S to where it emerges out of the ground – this is an underground stream flowing through openings in the limestone ground. Sadly, due to its accessibility and vandalism, this site has been abused with littering of garbage, fires and smashed formations. 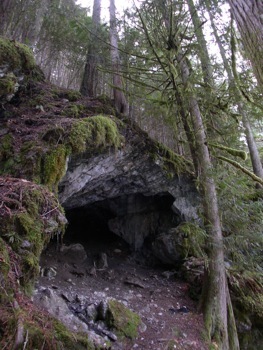 Another cave named ‘Slesse Creek Cave’ apparently is located N of Chilliwack Lake Rd and W of Slesse Ck. This cave is reported to be small. Other caves do exist nearby which are gated for their protection and are accessible only when accompanied by one of the custodians. 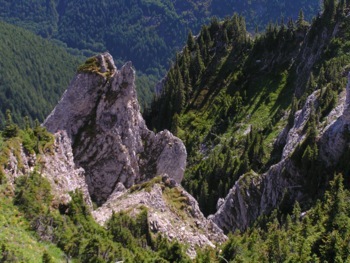 The areas most impressive karst features are found on the upper slopes of Mt. McGuire. 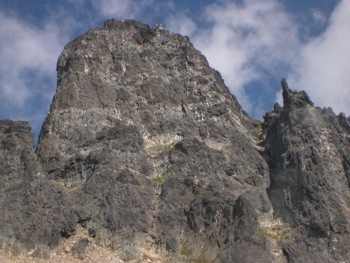 Limestone rock extends right to the summit and the impressive cliffs, especially on Mt. McGuire’s W slopes, provide the best exposure of limestone in the valley. Also, a cave entrance can be seen just to the N of the Mt. McGuire Trail in its upper reaches – this entrance is small and drops steeply. Do not attempt to enter this cave. Reportedly, there are other caves in the area. The FSR to this area is sometimes closed due to bridges out. The Chilliwack River Valley Cavers is a local organization that is involved with conservation, exploration, safety, and more. This group has acted as stewards to protect selected caves in the area. See www.cancaver.ca for more info. ‘On Sunday, November 24 1991, a group of three (Washington) cavers visited a blowing hole near the junction of Slesse Creek and Chilliwack River in BC. They were John Clardy, Tim Martin and Buff Martin. The cave was a 30m crawlway ending in a dig. The younger Martin brother worked at the entrance, disposing of rocks that the other two pushed out. At about 2pm there was little to do at the entrance, so Buff Martin built a small fire just inside. Sparks from this fell into a deep crack packed with dry wood debris. Alarmed he tried to put it out with water from his canteen, then urine and finally soil, to no avail. Embarrassed, he said nothing to the others but despite the outward flow, the air in the crawl soon became smoky. – Geological Survey of Canada Bulletin 481, Geology and Geological Hazards of the Vancouver Region, Southwestern BC, Editor J.W.H., Monger, Cheam Slides, pg 260-261, 1994.